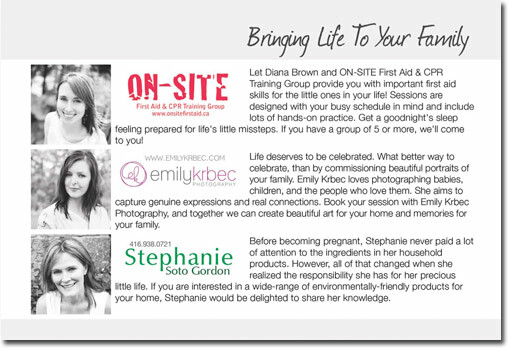 checked out our First Aid Supermom eBook, Photo Illustrated by Emily Krbec? is proud to be connected with such a fantastic community! Sanfilippo Syndrome is a rare genetic disorder that stops a child's normal development and most children with this syndrome do not live to adulthood. Successful research into this disease does not only help those affected by Sanfilippo Syndrome, but is also directly applied to related genetic disorders that affect as many as 1 in 5,000 children. We are proud supporters of the Sanfilippo Children's Research Foundation and we provide first aid & CPR training to their network of proud supporters. Please click here to visit the San Filippo Children's Research Foundation website. "The YWCA Teen Mothers' Program was fortunate to have Diana join our program and provide us with first aid/cpr training. The young mothers were a captive audience and both evenings were full of valuable life-long lessons and laughter. We are so thankful to have had the opportunity to meet such a wonderful, knowledgeable and down to earth woman. Diana truly made the experience a memorable one."